FIFA 16 is released this month, which means a whole new batch of ratings for our favourite players. EA have already released the ratings for some of the best players in the game, and there are some shockers: Gareth Bale, Alexis Sanchez, David De Gea and World Cup winner Thomas Müller have all missed out on the top 20, with some surprising choices in their place. So, without further ado, here are the top 20 players in this year’s edition of FIFA. Reinvented as a defensive midfielder by tactical mastermind Pep Guardiola, Lahm remains one of the best players in the game at the ripe old age of 32. His passing (84), defending (87) and dribbling (85) skills, as well as his surprisingly high pace (75), make him one of the best CDMs in the game. The ex-Spurs man has gone from strength to strength at Madrid, as reflected by his status as one of FIFA’s best central midfielders. With 84 passing and 89 dribbling, Modric is an ideal playmaker for any La Liga-themed team. Ramos remained with Real Madrid this summer after flirting with Manchester United, disappointing Reds and FIFA players planning to build Premier League/Spain hybrids in Ultimate Team. Nevertheless, you can’t argue with Ramos’ combination of pace (79), defence (87) and physical strength (81). Cesc hasn’t had the best start to the 2015/16 season, but his quality last season was enough to earn him a +2 overall stat boost. Even better, the slow decline of Barcelona’s passing wizard Iniesta and the absence of Xavi (who has moved to Al Sadd, who aren’t in the game) means Fàbregas has the highest overall passing (90) in the game. After winning the World Cup in 2014, Boateng is one of a number of German players to get a stat upgrade. With 79 pace, 87 defence and 84 physical strength, Boateng should be more than capable of stopping pace demons like Doumbia in their tracks. Seriously, Real Madrid are going to be unstoppable. The star of the 2014 World Cup, the artist also known as Ham-ez is fast (78), has a killer shot (86), great passing (84) and isn’t too shabby at dribbling either (85). Our defence is shaking in fear already. AGUEROOOOOOOOOOOO (©Martin Tyler) is the Premier League’s best striker and one of the best overall strikers in the game. He has pace (89), dribbling skills (89) and amazing shooting (87), which more or less guarantees goals galore. Iniesta isn’t the player he once was, hence a -1 stat downgrade, but he’s still one of the best midfielders in the world playing in arguably the world’s best team. He’s still got 87 passing and 90 dribbling, and he’s still worthy of a place in any La Liga team. Well, here’s a surprise: David Silva is the best Spanish player in FIFA 16. Of course, City fans will tell you that it’s well deserved: he’s been a mainstay of the team since joining, lighting up the league with pinpoint passes (as reflected by 89 passing) and silky skills (89). Ignore the silly haircut: Neymar has pace (90), dribbling skills (92) and a shot worthy of spending all your earnings on packs to try and get him. 5 star skills mean he’ll be the star of more than a few FIFA skillz YouTube compilations too. The man, the myth, the legend; at the ripe old age of 33 (soon to be 34), Zlatan is still one of the best strikers in the game (despite a -1 overall downgrade). He’s not the fastest, but his physical power (86) and shooting (90) should get you more than a few goals. Plus he’s a black belt! Despite Chelsea’s less than stellar start to the season, they still boast the Premier League’s best player in FIFA 16. Hazard is fast (90), incredible at dribbling (92) and his passing (84) and shooting (82) aren’t too shoddy either. Get him on your left wing as soon as you can. He may be 31, but Robben remains one of the fast players in the game (92 pace) and has an incredible shot too. You’re pretty much guaranteed to win with Robben on your right wing. Everyone’s favourite sweeper-keeper is the best goalkeeper in the game by quite a long way, and should be even better this year thanks to EA improving goalkeeper intelligence. He won’t be cheap, but Neuer should be the foundation of any Bundesliga team. The second part of the unstoppable Barcelona attacking trident boasts 88 shooting, 82 pace and 88 dribbling. With Neymar and a certain Argentian who hasn’t featured yet by his side, anyone playing as Barca this year will score bucketloads. Oof, that’s gotta hurt. Despite a +1 overall increase and winning the Balon D’Or, Ronaldo is still only the 2nd best player in the game. Still, he can’t complain too much: with 92 pace and 93 shooting, he’s still going to be practically impossible to stop. Who else? After record breaking year and a World Cup final, Lionel Messi is the best player in FIFA 16. He’s pretty much amazing at everything, and guaranteed to make any team. Even more scarily, you can line up Messi, Ronaldo and Suarez in a front 3 with more or less perfect chemistry. Gulp. Do you agree with EA’s ratings? Who would you have included in the top 20? Let us know in the comments! And if you’re planning to buy FIFA 16 but need some extra cash, why not sell games with musicMagpie? It’s FREE and easy; just click below to get an instant price for your stuff! 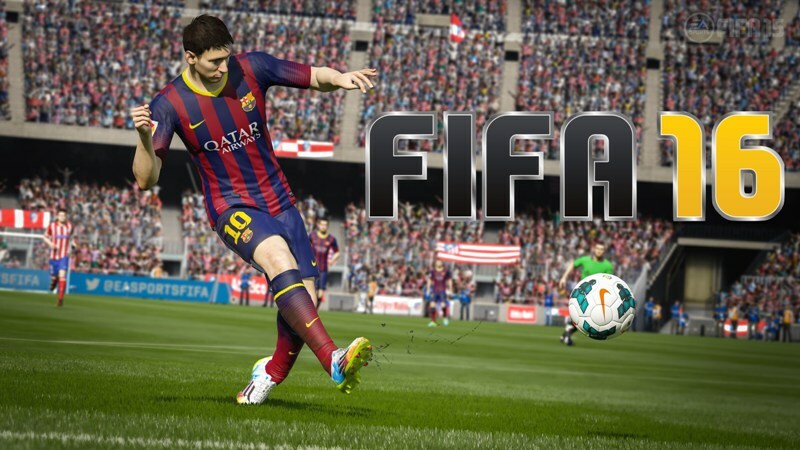 ← FIFA 16: What’s New?